African Sun Guest House - George Accommodation. 7/20 - Semi Self catering roomn with double bed and 2 singles. 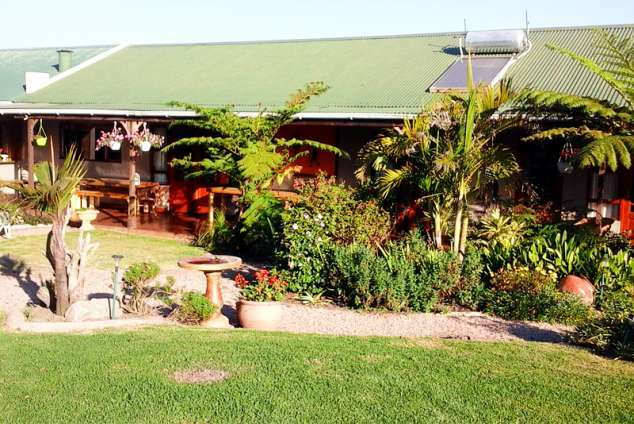 African Sun offers a relaxing atmosphere and a beautiful view of the outeniqua mountains, it is a small holding where guests can walk through the rose garden or sit out in the garden under an umbrella and read while you are served with a cup of tea. We serve breakfast on the veranda weather permitting and evening meals on request. We have animals for the children which they can handle and eggs to be collected a real treat. There is a strawberry farm in walking distance where you can pick or even hire a horse to ride. We serve a full South African breakfast, dinners on request. We have 2 flats each with 2 bedrooms, a full bathroom, lounge and kitchen. The main room has a double bed the other 2 single beds. 3 units which have their own bathroom and open onto the verandah, these each have a TV, microwave kettle and toaster also crockery and cutlery. The units have either a double bed or 2 single beds. Rondavels - Sleep 3 adults or 2 adults and 2 children. I am a member of the George Tourism and accredited by Western Cape region. I am a member of the Hop Route which has guided tours in the area. Braai available Gym (4kms away) Game drives (20kms away) Horse riding walking distance Laundry nearby Nature trails nearby Parking area secure behind gates Private entrance Airport (3kms) Golfing (2kms) Shuttle to and from airport Bass fishing is offered on-site Membership with George Tourism in partnership with Cape Town Routes Unlimited. 34013 page views since 15 Sep, 2006.